After peaking in the early 2000s, the number of elk in Rocky Mountain National Park has returned to a healthy range. The Elk and Vegetation Management Plan was implemented in 2008 to reduce the impact of elk overpopulation on vegetation and animal communities in the park. 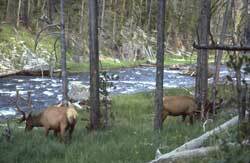 Bull elk graze alongside creek at Rocky Mountain National Park (Photo courtesy of National Park Service). The number of elk in Rocky Mountain National Park has decreased for multiple reasons. “Severe winters forced more elk out of the park and at the same time the Colorado Parks and Wildlife Division made increases in hunting outside the park particularly on adult females which is the reproductive engine,” said John Mack, wildlife biologist at Rocky Mountain National Park. The park also culled minimal numbers of elk, a strategic lethal reduction process. “For the last three winters, we haven’t had a need to cull animals because we have been at or below our population objective,” said Mack. Every month, the park organizes volunteers to do a ground count. “We drive on certain roadways where elk will be more visible and repeat the count for three consecutive days,” Mack said. They also perform classification counts in which they count the number of calves and compare that number to the number of adult female elk to calculate reproduction ratios for that year. Cow and calf at Rocky Mountain National Park (Photo courtesy of National Park Service). Dr. Margaret Wild, lead veterinarian of the National Park Service Wildlife Management and Health Program, identified another contributing factor to the recorded decrease in the elk population. “We’re seeing a pretty high mortality of elk in the park. We’ve gone from a situation about 10 years ago where there were way too many elk in the park to a situation now where there are not too many elk in the park,” said Wild. According to Wild, chronic wasting disease is prevalent in one area of Rocky Mountain National Park. Chronic wasting disease (CWD) is a contagious, fatal neurological disease. Caused by proteins known as prions that attack the brain, elk become weak and thin, display abnormal behavior and ultimately die. Click on the video at left to view an audio slideshow about the impact of chronic wasting disease on Rocky Mountains elk prepared by writer Audrey Winkelsas. “In the wild, we don’t know the most common way the disease is transmitted,” said Wild. From laboratory studies, it is known that there are several potential routes, she explained. Vegetation can become contaminated from an infected animal’s saliva, urine or feces and another animal that grazes there is at risk. Additionally the disease may be transmitted if an animal eats vegetation contaminated by an infected animal’s carcass. 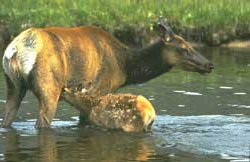 Some scientists believe that the disease is dependent on the density of elk while others do not believe the disease to be density-dependent. “I think a lot is the fact that high densities have led to a highly contaminated environment, which is why we see what we call this hotspot of chronic wasting disease activity in one part of Rocky Mountain National Park,” said Wild. Moraine Park is the area to which Wild is referring and it has a historically high density of elk in the winter. Elk in Moraine Park (Photo by Jacob W. Frank https://www.flickr.com/photos/rockynps/15452070592/). Cows, as female elk are called, in Moraine Park have a CWD prevalence of 13 percent. In surrounding areas of the park, that number is generally less than two percent. Despite the prevalence of CWD in elk at Rocky Mountain National Park, typical park visitors do not need to take special precautions against becoming infected, according to Patrick Bosque, associate professor in the Department of Neurology at the University of Colorado Medical Center. “Chronic wasting disease has been prevalent in deer and elk in northern Colorado and southern Wyoming for decades. It is very likely the hunters have eaten animals infected with CWD prions. Yet there is no obvious increase in the rate of human prion disease among hunters. So the practical conclusion is that the risk is not great,” Bosque said. “Hunters can have animals they kill tested for prion disease. It is not required, but my recommendation is that if they are hunting in an area known to have CWD infected animals, they have it done,” said Bosque. While it seems unlikely for a human to become infected from CWD prions, it may not be altogether impossible, said Bosque. Nonetheless, Bosque urges people to keep the potential risks in perspective. “The CDC estimates that 5,000 people in the U.S. die each year from food-borne illness. So far, none of these are thought to have been from exposure to CWD,” Bosque said. In an attempt to reduce the spread of chronic wasting disease, one tactic Rocky Mountain National Park has implemented is removing the carcasses of animals they suspect to be infected with CWD. “High densities of animals, particularly that are sitting in one location, can really contaminate their environment. So one thing you can do is try not to have high densities of sedentary populations. Now that there are fewer elk in the park, that can probably help,” Wild said.